"Warm, gooey, chocolaty s'mores without the campfire." Break chocolate bars into a saucepan over low heat. Add milk. Heat, stirring constantly, until chocolate is melted, about 5 minutes. Pour into 8-1/2x6-1/2-inch casserole dish. Arrange marshmallows over melted chocolate. Bake dip in the preheated oven until marshmallows are golden brown, 4 to 7 minutes. 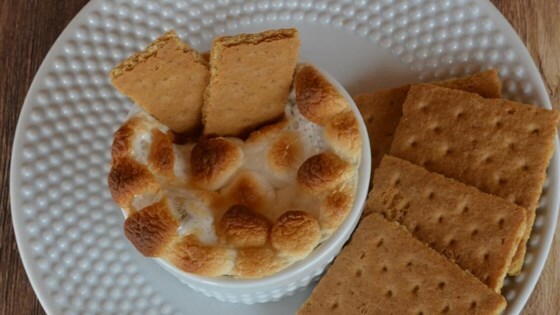 Serve dip with graham crackers. Chocolate and Marshmallows MMMM! I made an individual serving. Don't forget to spray the pan or in this case, an individual ramkin! Watch carefully, so you don't burn your dip. IT IS SOOOOO YUMMY!!!!!! #1 #1 #1 #1!!!! I made this for my family and they loved it!! Better than campfire s'mores! Yum! !